In a previous chapter of my life, I was a fishmonger. Here I learned cod recipes from this country as well as many Mediterranean Diet recipes. At first, in a supermarket, but after college, I was a buyer, cutter, and purveyor at a small family-owned fish market. Even though I grew up by the ocean, it wasn’t until then that I began to enjoy eating fish. That is when I learned what really good fish should taste like. If you are lucky enough to have a local market near you, I suggest paying them a visit before you settle for what is offered at the fish counter in your average grocery store. A fresh cod fillet should be glistening and firm with no odor at all. Ask about it. A knowledgeable and trustworthy fishmonger will happily indulge your curiosity. For this recipe, I like to find a large fillet because it presents nicely when displayed in an attractive baking dish. You can fold the thin tail piece under to adjust the length and to even out the cooking a bit. It’s not always easy to find a large fillet, but don’t worry… two laid out side by side will work nicely. Work with what you have, but pick the better fish rather than fret over the size of the fillet. I reverse-engineered this recipe after ordering the dish at Pera Mediterranean Bistro in Williamstown, MA. In it’s most distilled form, beside the fish, the ingredients include olives, sun-dried tomato, pepperoncini, basil, feta and of course, good olive oil. I’ve added some ingredients here, and I encourage you to improvise with whatever you have that fits the palette of flavor created by these condiments. I’ve included artichoke hearts, onions, roasted red peppers, and capers all to good effect but limit the variety. 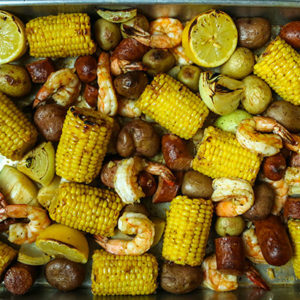 Any number of fresh vegetable sides and starches pair well with this light and fresh main dish. When the oven is preheated, you can ask a special person to assist you or invite everyone to help decorate the fillet as a symbolic contribution to the meal. 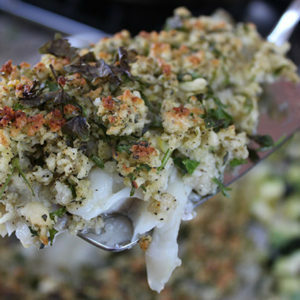 Preheat the oven to 400 degrees, then pour olive oil into your favorite baking dish that fits the size of your fillet. Take a handful of the baby spinach and smooth the oil around the surfaces of the dish then add the rest of the spinach to form a fluffy bed for your fish. Lay out your fillet (or fillets if you could not find a single large one) on the spinach bed lengthwise in the dish, skin-side down. 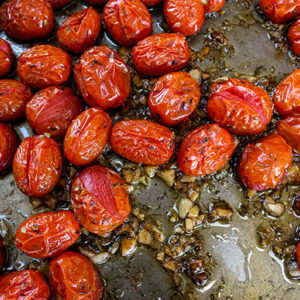 Sprinkle with sea salt and fresh black pepper to taste, then drizzle with olive oil. What happens next can be enjoyed with guests... Decorate the fish fillet with the slices of olives, sun-dried tomatoes, pepperoncini and optionally the pine nuts. Break open and add the dried hot pepper or sprinkle with pepper flakes. Enjoy this part of the process. You don't want to cover all the surface of the fish, just decorate it in patterns. If you have small pepperoncini, you might add those whole. Fresh herb finale! Chop the fresh herbs or tear into pieces then sprinkle it liberally over the fish. If the oven is ready, or when it is, pop it in uncovered! Set timer for 10 minutes. After 10 minutes take the dish out of the oven. 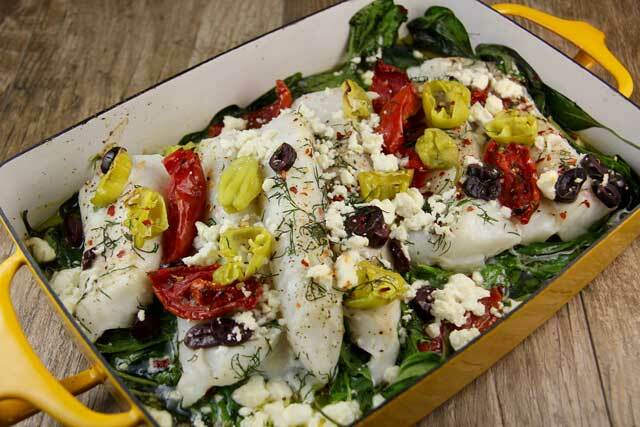 Crumble the feta evenly over the fish and return to the oven. Check again in 5 to 10 minutes depending on how much cooking you think the fish needs. Note: less is more. I like when my cod is white along the edges but translucent in the center of the fillet... firm and juicy. When you take the fish out of the oven, you can cool it on the dinner table for a few more minutes which means it will keep cooking. Serve family style from the dinner table with some fun serving instruments so that everyone can get a nice piece of fish, wilted greens, and as much condiment and broth that is desired.